Stains and tracking dyes are offered for detecting nucleic acids in gels and monitoring electrophoresis runs. 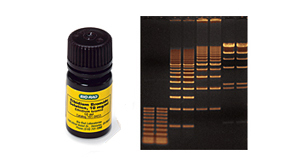 Silver stains and fluorescent gel stains are provided to detect nanogram quantities of nucleic acids. Silver staining is a rapid and highly sensitive method for detecting proteins and nucleic acids in polyacrylamide gels. Bio-Rad offers kits and solutions for silver staining. Ethidium bromide is a sensitive fluorescent stain for visualizing DNA in agarose and polyacrylamide gels. Bio-Rad offers ethidium bromide in a ready-to-use solution.